Imagine a house that resembles something out of The Jetsons. Now think about how difficult that would be to build. 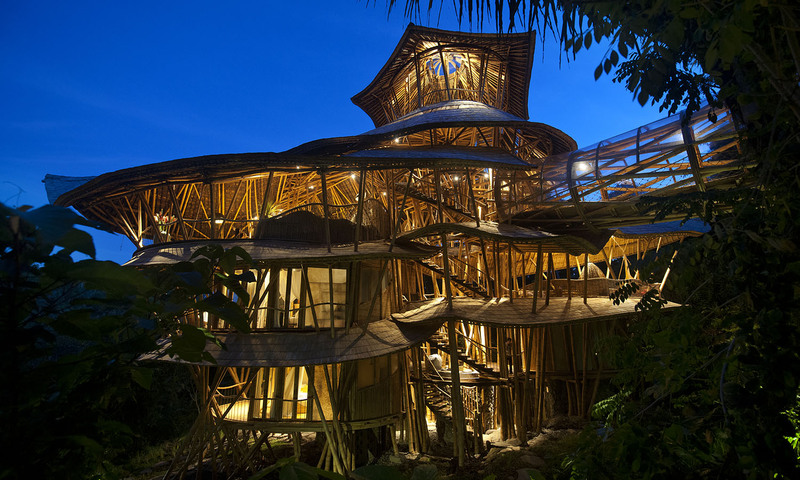 Not only has it happened on the banks of Bali’s Ayung River, but this spectacular six-storey abode has also been created entirely from bamboo. Up to 11 people can be accommodated in Sharma Springs' four bedrooms. Many of the living areas are open at the sides, allowing guests to feel at home in the forest, and there’s an office space (just in case you feel like you have to stay forever), media room, kids’ play room and a private garden with a pool. It’s part of a planned sustainable community only 25 minutes from Ubud, so you can head into town if you feel the need to escape all this peace and quiet.